Sunday May 25th 1909 There was things to see to [shot?] I did not stay in bed late I have more chickens hatching so was busy all forenoon. I put in most of the afternoon in bed. [illegible] is in [Bekotee?] but [illegible] expects him home tonight. Monday May 24th 1909 The men began work on the new addition to the home today they got it framed and things put on the roof so it would not get very wet inside if it rained. I worked some in the morning and was busy with the work. Will doing painting and helping about things my chickens are so much work. 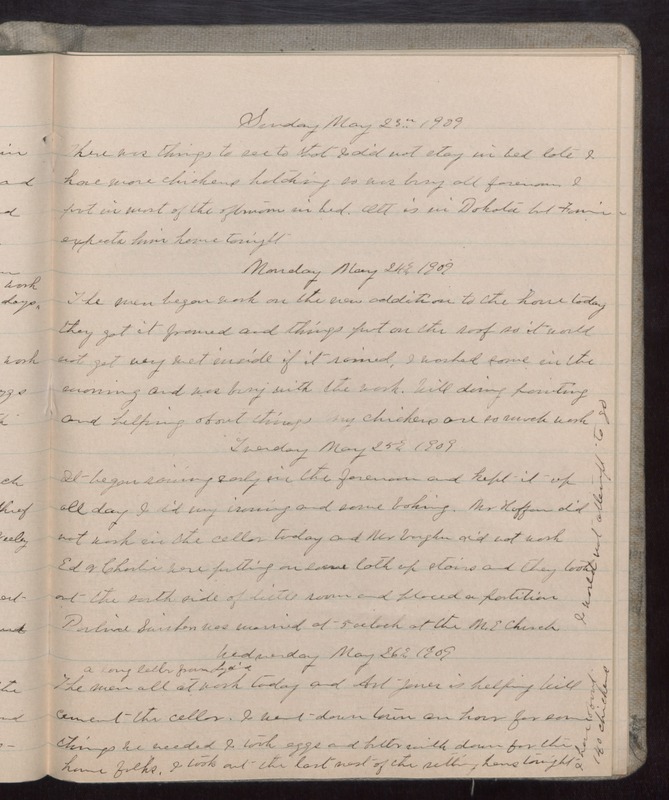 Tuesday May 25th 1909 It began raining early in the forenoon and kept it up all day I did my ironing and some baking. Mr Hoffman did not work in the cellar today and Mr Vaughn did not work Ed & Charlie were putting on some talk of stairs and they took out the earth side of the little room and placed the partition Pauline [Suirken?] was married at 5 oclock at the M.E. Church I would not attempt to go Wednesday May 26th 1909 A long letter [grandyd'd?] The men all at work today and Art Jones is helping Will cement the cellar. I went down town an hour for some things we needed I took eggs and butter with down for the home folks. I took out the last nest of the setting hens tonight. I have about 140 chickens.